Each year San Francisco receives millions of visitors from the US and around the world. In fact, over 25 million tourists visit San Francisco each year making one of the most visited cities in the world. Many of these tourists are traveling in an RV that they own or have rented for their road trip to SF. Some only visit for a day. Others stay for a few nights. And others stay for weeks at a time. But no matter how long they stay, all of these RVers are looking for the same thing when they visit: RV Parking in San Francisco. Parking is at a premium in San Francisco. There just seem to be more vehicles than parking spots. And RV campgrounds are limited too. But with careful planning and a little research finding good parking in San Francisco can be much easier. Is RV Parking in San Francisco available? Yes, there is plenty of RV Parking available in San Francisco for day parking and overnight parking. So read on so you can learn how to park legally in San Francisco to ensure you stay out of trouble. We also cover SF RV Parks and campgrounds, and other great locations to find parking. Where Can I Day Park an RV in San Francisco? Day Parking in San Francisco with an RV can be a challenge. And the bigger your rig the tougher the challenge. If you have a large RV it might be best to park just outside the city and Uber or bike from there. When we visited SF we parked in one of the parking lots on the north side of the Golden Gate Bridge, then we biked across the bridge into the city. We used our bikes and the Trolley system to explore all over the place and got back to the RV around 10 PM. It was free to park and we had an awesome day. By the way, if you plan to rent bikes in San Francisco, I highly recommend riding over the golden gate bridge! Check out our article called 11 Awesome Tips for Bike Hire or Rental Across the Golden Gate Bridge for more info. Riding over the GGB is once in a lifetime experience that most people never get the chance to try! You can street park in SF if you have a smaller RV. Parking is allowed on any street in SF as long as there is no sign posted which restricts parking. But RVs must park at least 100 feet from any intersection so they don’t block the view of that intersection. We had no trouble parking in Haight Ashbury or near the Japanese Tea Garden in our RV. We were careful to read the no parking signs and we parked where there were no restrictions. I like to think I have good parking karma (get it parking car-ma) but Susan refers to me as the parking zen master. IMPARK owns many parking lots and garages around SF. They have one lot in the whole city that allows Bus and RV parking. It is Lot 39 located at Pier 48 on Mission Rock Street near Lot A at Giants Stadium. It’s $35 a day to park from 6AM until midnight unless there is a special event. Then the price jumps to $60. There is no overnight parking allowed here. Some folks have tried parking in the BART lots, which stands for Bay Area Rapid Transit and taking public transportation to SF. But, no vehicles over 19 feet are allowed to park in the BART lots. However, BART typically only enforces this rule on weekdays. The BART enforcement personnel are off on the weekends so it may be possible to try to park in a BART lot for the day and ride into SF on the weekend. But you do so at your own risk. Can I Park an RV Overnight in San Francisco? RVs can park overnight in SF on any street that is not posted. In most of San Francisco if overnight parking is restricted the sign will say no parking from 12AM to 6AM. However, South San Francisco restricts parking from 10PM to 6AM. There are also many signs posted which restrict parking overnight for street sweeping. You can also park overnight in California’s Rest Areas. The state of California allows parking in Rest Areas for a maximum of 8 hours in any 24 hour period unless there is signage to the contrary. There are two rest areas near San Francisco. The H Dana Bower Rest Area is just North of the Golden Gate Bridge and has restroom facilities. Crystal Springs Safety Roadside Rest Area is located about 20 miles south of SF in Burlingame, CA and has restrooms and vending facilities. This link will take you to an interactive map of all of California’s rest areas. There are no Walmart stores that offer overnight parking in SF. Nor do Costco, Home Depot or any other of the large chains that allow free overnight parking in other areas of the country. The homeless problem in SF has created a situation where allowing RVers to park for free is not feasible anymore. What Are The Parking Rules In San Francisco? Check out the website for the SFMTA for a full article on How To Park Legally in San Francisco. However, there are two important parking violations that aren’t spelled out on this webpage. No vehicle over RVs can street park between the hours of 12 AM and 6 AM if posted. No RVs can park within 100 feet of an intersection. Always check for parking signs and street sweeping times. Be sure to look 100 feet in both directions for any posted signs regarding parking. 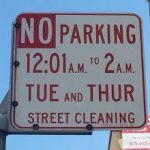 San Francisco has an active street sweeping schedule so make sure you look for signs noting those no parking hours. About 90 percent of San Francisco streets are swept each month. Here is a link to DPW’s Street Sweeping Schedule. Once on the page enter a street and then hit search. In the box to the right scroll down to the street sweeping schedule for that street, and the surrounding streets as well. 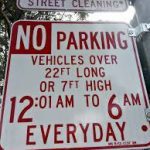 If there are no parking restriction signs posted for permit zones, street sweeping, meters, posted time limits, or the like you are allowed to park in one spot for up to 72 hours. Then you must move your vehicle at least one block. When parking parallel to the curb your wheels must be within 18 inches of the curb. Seems kind of far off the curb to me though, especially if you are driving an RV. I would shoot for 6 inches from the curb instead. San Francisco is known for its steep hills. So when you park on a hill angle your front tires so if the brakes of your vehicle were to fail, it would roll into the curb and not into traffic. A driveway begins at the curb cut or the point at which the curb begins to slope downward toward street level. A vehicle parked within a curb cut can be cited and towed. Even partial encroachments into the driveway area can result in a tow. What Does Each of the Curb Colors Mean? GRAY CURBS: Gray curbs are areas where anyone can park for up to 72 hours unless restricted. You should look up and down the street for 100 feet from your parking spot for any signs that could restrict parking. YELLOW CURBS: Yellow zones are only for commercial vehicles actively loading or unloading freight. These zones are typically used for large businesses or properties that receive or deliver a lot of shipments. RED CURBS: Red zones are “No Parking” zones. Do not park in a red zone at any time. BLUE CURBS: Blue zones are parking spaces for people with a valid disabled parking placard or license plate. They are effective 24 hours a day, seven days a week but still subject to tow-away zone restrictions or special event or construction restrictions. Do not block access to a blue zone or park in one without a valid placard or license plate. The fine is severe and your vehicle may be towed. GREEN CURBS: Green curbs are for short-term parking, generally not exceeding 10 minutes. Check signage or curb stenciling for effective hours. In metered areas, green meters will have either a 15 or 30-minute time limit. However, vehicles displaying disabled placards or plates are exempt from the time limits for green curbs and meters. WHITE CURBS: White zones are for passenger loading and unloading during certain hours with a time limit of five minutes and the driver has to stay in the vehicle. Check for nearby signs or stencils on the curb for effective hours. Some white zones are restricted to certain types of vehicles, such as taxis or tour buses. Where are the Best RV Campgrounds in San Francisco? Candlestick RV Park is the only RV Campground in San Francisco. They have 165 gravel parking lot sites with full hookups and 24 tent sites. The site offers amenities such as a restroom, laundromat, grocery store, game room, and they sell propane. And best of all they are located 4 miles from downtown SF. It costs about $110 per night to stay there but the location can’t be beat. San Francisco RV Resort sits on the Pacific Ocean and is located 15 miles south of downtown SF. They have 150 paved RV sites with full hookups. Resort amenities include a clubhouse, swimming pool, whirlpool/spa/hot tub, store, restroom/shower, laundry facilities, picnic/BBQ area, and playground. The campsite also has a WiFi Hotspot and its also pet-friendly. They have a 3 night minimum in season and rates run from $100 to $130 a night depending on your campsite. Treasure Island RV Park is located in South San Francisco about 11 miles away from Downtown SF. The park has partial hookup sites with water and electricity and it runs about $75 a night with a 2 night minimum on the weekends. It features newly remodeled bathrooms and laundry facilities and it is pet-friendly. Treasure Island does not have a dump station so you will need to find one elsewhere. Marin Park is located about 10 miles North of San Francisco and has 87 RV spaces with full hookups. The Park is pet-friendly and has the following amenities: swimming pool, restrooms with showers, laundry facility, office store with RV supplies, and free cable TV. The cost to stay is around $100 per night with no minimum number of nights required. 1. Where Can I Rent an RV for My West Coast trip? There are several good places to rent an RV. Cruise America and El Monte RV are both well known and have a good reputation. And Outdoorsy is a fantastic place to find a wide variety of RVs to rent anywhere. You can also check out our article called 4 Best Rental Options for a Small Drivable RV for more details. 2. What if I Want to Bike Around the City, Is There a Good Place to Rent Bikes? There are many places to rent bikes around San Francisco. I wrote an article called 11 Awesome Tips for Bike Hire or Rental Across the Golden Gate Bridge. Although it is about renting a bike to cross the GGB it also gives great tips for renting a bike anywhere in San Francisco. 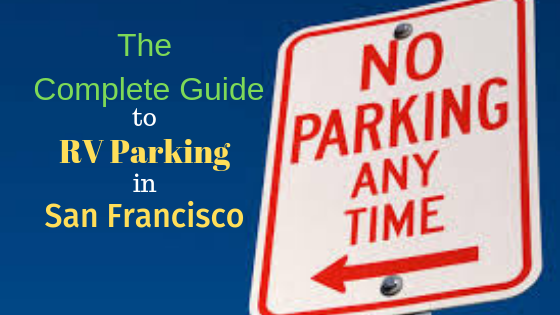 There is parking for RVs in San Francisco but you need to be aware of and follow the parking rules of the city. If you are careful and read the street signs you should be able to park worry free and have an awesome time exploring this amazing city. Do you have some great intel or a question about parking an RV in San Francisco? Please leave your comment below! Thanks for reading this article and if you would like to contact us directly, please feel free to visit our Contact Page to send us an email. Thanks for the great information! We’re in the Southwest this year, so this may come in handy for us. We loved San Francisco and hope you get a chance to go there! We were able to stop there while traveling all through California from Death Valley to Sequoia National Forest and along the PCH from SF all the way to Huntington Beach. Feel free to hit us up if you have any questions! I think I would be terrified to take my RV into San Francisco. We flew there last year and there was so much traffic. We’re going to be out near Sacramento this summer and I think we’ll take the ferry from Vallejo to SF. I think that is a great idea. If you can avoid driving downtown, your visit will be much less stressful. Luckily our RV is only 24′ long, and when we were in SF our rig was a class C that was only 19′ long. So that made things much easier.